Founded in 1983 with a $30,000 loan and two military surplus desks, BBK Worldwide has become a global, multi-million dollar corporation that is changing the face of patient recruitment for clinical R&D in the pharma and biopharma industries. Today, our founding principals, Bonnie A. Brescia and Joan F. Bachenheimer have created a global enterprise – one that that is true to their philosophies of how a business, its products, services, and culture can create new opportunities for its staff, clients and benefit consumers. Sharing more of her dynamic experience and knowledge as a successful female entrepreneur, Bonnie will be featured tomorrow afternoon on Global Reach’s online broadcast. An accomplished entrepreneur and mother, Bonnie will discuss international partnerships, market strategies, innovative technologies, and more. Tune in tomorrow, October 9th, to listen to the live broadcast. Listen to the live broadcast here. 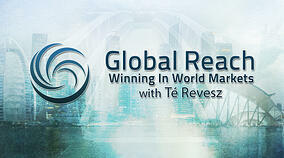 To learn more about the Global Reach show, please visit http://www.voiceamerica.com/show/1984/global-reach.